Holidays and spending time with family have always been a huge part of my life. All the family time spent together over the last sixteen years, has made me who I am today. My happy little family has always been there for me and my siblings whether it is a dance competition, hockey games, band/choir concerts, birthdays, and most of all the holidays. In my family, holidays and birthdays have always been the time where the whole family tries as best as we can to get together, but it wasn’t always easy. Growing up with family spread out from Amery Wisconsin, places in Minnesota, all the way to Anchorage Alaska, makes for small family gatherings. It was always hard to get the whole family together for holidays and it would soon get even tougher. Every year on Thanksgiving the majority of my family would get together at my Grandma and Grandpas house right outside of Amery. Since I can remember, every Thanksgiving has been the exact same, just with different and fewer people as the years went on. As soon as the Thanksgiving Day Parade started, it would be up on TV. By this time the family was slowly arriving and the sound of happiness was beginning to form in the big house. The smell of the food could be smelt at the end of the long driveway and the house filled with excitement. While our mouths would water for the delicious food that was about to be ready, the adults would sit at a table and lay out ads for the stores they want to go to the next day. Since there were a lot of little kids in my family during this time, planning Black Friday shopping was important. It was a day where the parents would go pick out the perfect Christmas presents. While the adults were busy planning, laying out papers, the kids would go up to the loft in my grandma’s house and watch movies or talk and laugh. Even from being up above the rest of the big house, our high little giggles would fill the house, letting everyone know how much fun we were having. Soon enough, the smell of the food would get stronger and we’d all file into the kitchen for a delicious lunch of mashed potatoes and gravy, stuffing, turkey, rolls, cranberries, sweet potatoes, and most of all, pies. After we would eat, the guys would go out for an afternoon hunt while the girls would sit around and circling and highlighting the things they want to buy from the stores. Once everyone got back in the house we would all sleep around the blazing fire in the living room. Once everyone would wake up, my grandma would separate the food so that everyone got a little of her cooking to take home. Later that night we would all say our goodbyes hoping to see the rest of the family at the upcoming Christmas. When Christmas would roll around my mom would always plan the meal around who was going to be there. When I was in first grade, it was the biggest Christmas I can remember. My whole family made the trip from their homes, to ours in little Amery. This Christmas was the best and last one we’d all have as a family. Little by little the piles of presents under the tree was growing as the family would come trudging up the snowy steps. Once everyone was home from Church we sat around the kitchen and living room, the house filling with the sound of laughter and stories from the previous year. Since my house didn’t have a loft, the kids, would have to stay out with all the adults and try to be as quite as we could so we didn’t get “shh”. When the smell of the food surrounded the house, we knew it was time to dig in. 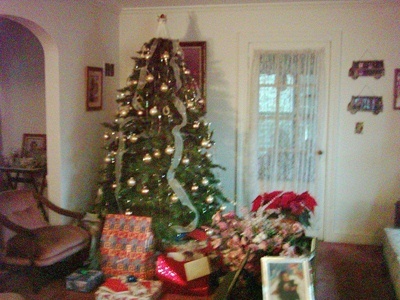 After dinner the party would migrate to the living room to open the mounds of presents under the tree. When all the presents were open and the food was eaten, it was then time for board games, the family specialty. When it soon came time to say our goodbyes, we hoped to see everyone in a year just so we could recreate the magical night. As the year went on and holidays would come and go, the less people would get together. No matter how long it may have seemed we always knew we’d see the family again in a matter of months. At the end of my first grade year, my brother was graduating and moving to college in the cities. The day came for my brothers’ party, and the whole family to get together for another time that year. This time, they all spent a few days at my house, and everyone seemed so happy to be together again. I thought after they left, everything was going to stay the same, other than my brother moving away. Until I got the news that would change my life forever. My Mom and Dad told my brother, sister, and I that my dad was moving out and they were getting a divorce. A few days later, we helped my dad move all of his stuff out of our house into his new house. I was so confused why this was happening, none of my friends’ parents were divorced and being totally honest, I didn’t really know what it meant. I didn’t know why my mom was at home when my dad wasn’t, why some nights I had to go to my dads new house and sleep there for the weekend. Fourth of July was another big Holiday for my family, but that year, half of my family wasn’t there. The only thing I could think about was the holidays that would no longer be spent with the family, those happy Thanksgiving days and magical Christmas nights weren’t going to feel the same. When the leaves fell, the snow blanketed the ground and the air turned crisp, it was time to get ready for Thanksgiving. When the big day came around, it didn’t feel the same walking into the house. The smell of food still surrounded the house and when you walked in the door you could still feel the excitement, but this year something felt different about it all. The laughing and telling stories was still there. The same food and the same routine of laying out ads on the table, going out for the afternoon hunt, sleeping around the fire was still there, but the house seemed empty. We were missing something and everyone could feel it, but nobody wanted to bring it up and ruin the exciting day. The two of them continued to circle all the items in the papers that interested them as my grandma got a call. We all scramble to find out coats, shoes, hats, and mittens and head start the hike down to the pasture to see what they had for us. The closer we got, the clearer it became, all the guys were standing down by the fence in their blaze orange clothes telling us to hurry. Once we got down there, we noticed a huge buck lying next to my brother. This thanksgiving may not have been the best without everyone but my brother shot his first buck, there was more food for us to take home, but most importantly, there was more quality time spent with the family. I shrugged my shoulders again and marched out to the kitchen for a filling dinner. After we polished off our plastic Santa plates and threw them in the garbage, we slid out to the living room. Before we could open the smaller piles of presents, my mom wanted a picture in front of the shining tree so she could remember this magical snowy night. She set up the camera and we all got into our spots for our new and improved family picture. Christmas, which was always a magical time in my house seemed a little less magical that year, the family was smaller and conversation quieter but that didn’t bother me. It didn’t bother me that I didn’t get my heaping pile of sparkling presents because it was that day that I realized what the holidays were really about. They are about the memories that you make with the people who mean the most, family. Whether you have one Christmas or ten, all that matters is that you’re with your family.